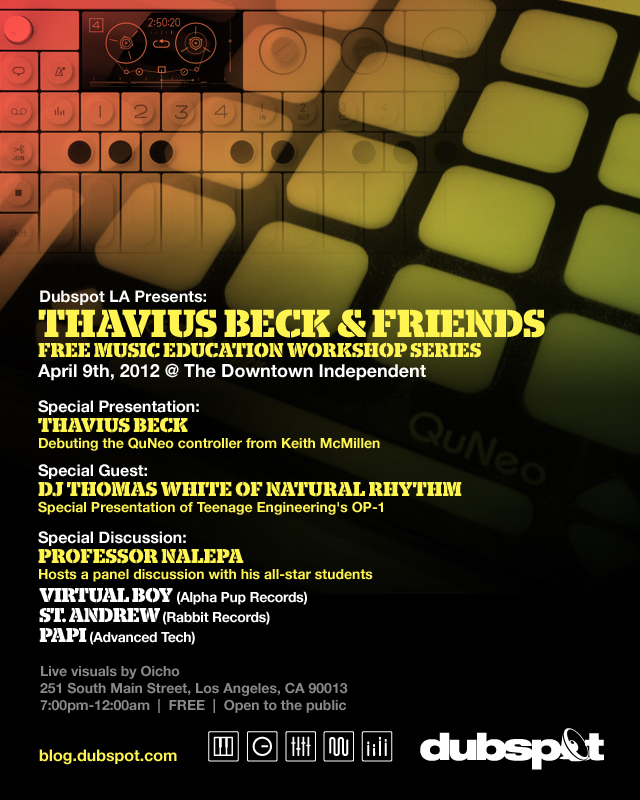 On Monday April 9, 2012, Dubspot hosted a special, super-sized “Production 101” workshop at the Downtown Independent Theatre in Los Angeles with Professor Nalepa and Thavius Beck and a few special guests. The evening focused predominantly on new technology including the debut of Keith McMillen‘s QuNeo controller and a special overview of Teenage Engineering‘s OP1 by Thomas White (Natural Rhythm). In the second part of this video recap, house music producer and synth enthusiast Thomas White (Natural Rhythm) joins the workshop with a demonstration and performance with Teenage Engineering‘s OP1 synthesizer/4 track recorder. The OP1 is an all-in-one production and performance device that offers synthesis, sampling, digital recording and effects in a small and beautifully designed package. White takes this incredible instrument through its paces and explains how this device changed his production flow at large.